Police are investigating the stabbing death of a 43-year-old man after a domestic confrontation escalated into violence last week. William Graham Jr. was declared dead at Memorial University Medical Center after the 6:45 p.m. incident at his residence in the 1000 block of West 45th Street. His brother, Emmanuel Lorenzo Graham, 29, of the same address, was questioned by Violent Crimes detectives and released when the investigation indicated that the victim was the aggressor. Investigators determined that William Graham "had become involved in an altercation with his sister and Emmanuel Graham had intervened. The confrontation between the two brothers escalated to the point that Emmanuel Graham was injured and William Graham was stabbed by his brother," according to a police spokesman. The investigation is continuing with in collaboration with the District Attorney's Office. • Police are trying to identify the name and gender of the driver in a single-vehicle crash this morning that killed both occupants. Jennifer M. McLaughlin, 30, died at Memorial University Medical Center where she was transported after a patrol officer pulled her out of the burning car about 5:30 a.m. The driver of the tan Oldsmobile 88 died in the fiery crash. The car had sped away from an SCMPD officer who approached it on foot when he saw it parked at the Islands Expressway boat ramp moments earlier. It narrowly missed a patrol car on Goebel Avenue and crashed into several trees at Foster Street, erupting into flames. + Police are expanding their search for a man who attempted to rob a bank last week and are asking the public for help. Police released photos of the suspect, described as a black male in his 40s or 50s wearing a blue hat, dark shirt with a pattern on the front, jeans and white shoes. The man entered the SunTrust Bank in the 2500 block of Abercorn Street about 2:45 p.m. with a brown rag over his face and handed a teller a note demanding money. 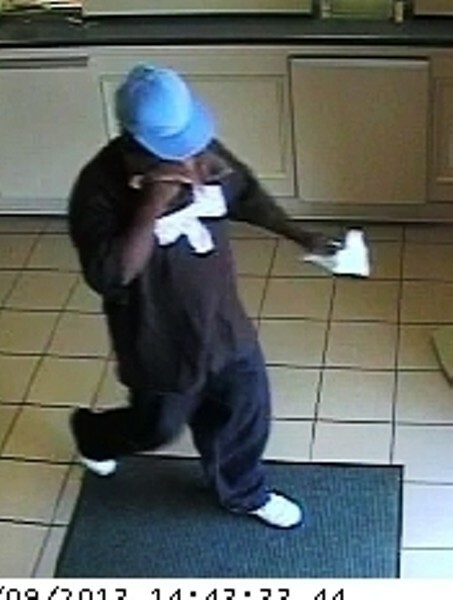 "The suspect then retrieved the note and left, taking no money with him," police say. • A Dublin man was killed and two women in the car with him were in serious condition after a multi-vehicle crash on U.S. 80 East Saturday, which had traffic backed up for miles. Ben McDaniel, 25, died at Memorial University Medical Center after the 5:43 p.m. crash 1.5 miles west of Fort Pulaski. Diana McGrady, 51, who was driving one of the vehicles involved in the crash, and Grace McDaniel, 18, a passenger in the car, remained in serious condition. Both women also are from Dublin. Alexander Gunn, 18, of a Wren Court address, and Taylor Brown, 18, of King George Boulevard, both of Savannah and occupants of another vehicle, were transported to Memorial University Medical Center for treatment of minor injuries after the 5:43 p.m. collision. Police say Gunn was traveling eastbound when he suffered "a medical condition. "The pickup truck he was driving crossed the center line and sideswiped a pickup driven by James Hammond, 45, of Ellabell, GA, who was pulling a boat and trailer. Gunn's pickup then crashed head-on into the car driven by McGrady.